I have never heard about co-washing until I started reading more about hair care. Co-washing is the process of washing the hair with only conditioner; no shampoo. There are a lot of naturals that do not wash with shampoo because of the fact that some shampoos can cause hair to be dry and brittle. You can co-wash during the week before your regular wash day, sort of to kick in some moisture into dry hair. You can also co-wash instead of shampoo, but still do your regular pre-poo and deep conditioning steps. This is the first time I am doing co-washing. No... I didn't do it on my hair, yet. I wanted to see how it will work on my 4c hair-ed girl. Her hair was a little thirsty looking, so I decided to co-wash her hair. 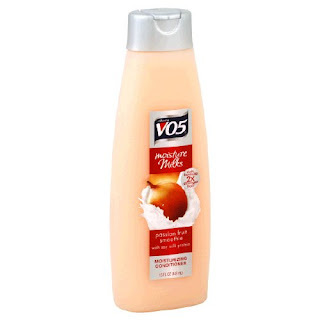 I used VO5 Conditioner Moisture Milks Passion Fruit Smoothie. At first I did not want to buy this product because of the cheap price (I paid 98 cents). I thought it will not work well. It is not only a cheap product but one that has no silicones so all you Curly Girl Method naturals can use this product. Don't judge a product by its price. First of all, I love the smell of this product. 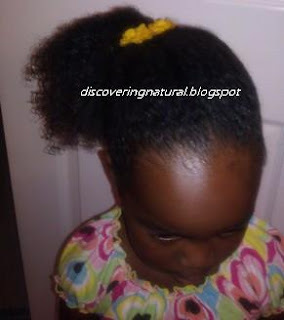 I actually didn't detangle her twists before wetting her hair with water and applying a quarter-size of conditioner. Why didn't I detangle? I was in a bit of a rush. I just kept my fingers crossed and prayed that her hair would not be a tangled mess. I most say, I love this product. Her hair was detangled, very quickly, NO COMB used. It felt moisturized, and had wonderful slip. (Definition of Slip: Hair feels slippery after washed and can easily be combed through). I didn't even have to comb her hair, I used just my fingers. Now the next test will be to see how co-washing affects my 3c/4a hair-ed girl and my transistioning hair. I will make sure to report back. Do you co-wash? What products do you use? I'm talking about "Breakage". We've all experienced this at one time or the other. But do you know the difference between Breakage and Shedding? I was totally clueless about this prior to transistioning. 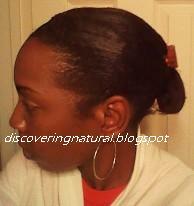 When I was relaxed, I would have a lot of hair breakage and over the years, I thought that was normal. I just thought if you comb your hair, you should experience seeing hair left on the comb or brush. I didn't realize that there was such a thing as shedding. 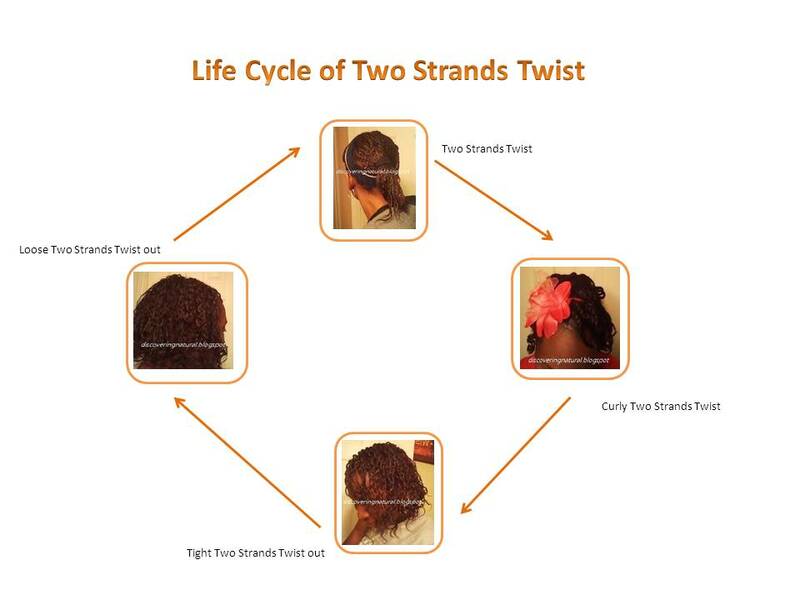 Let's understand the differences between breakage and shedding. Hair that has been shed is one that has come to the end of its life cycle. It usually contains a white bulb at the end. This is normal. Research as shown that we shed an average of 50-100 hair strands per day. Sounds scary, huh? Well, new hair is suppose to grow where the shedded hair was. When hair is deprived of proper moisture, breakage can occur. It is very important to keep your hair properly moisturized. Daily moisturizing and weekly deep conditioning will help you with breakage. Try to use water-based products because these products provide the best moisturizing agents. Don't forget to seal your hair with some oils or cream. In addition to moisture, you will need to strengthen your hair strands. This can be done by adding protein products to your hair routine. Protein is known to help rebuild weak hair strands. There are several protein treatments products that you can use. It is important to properly follow the product application instructions. Mishandling of hair can also cause breakage. I notice less breakage when I do not use a comb on my dry hair. If I want to comb my hair post wash day, I spritz some water mixed with a little leave-in conditioner and carefully either finger comb it or use a wide-tooth comb. On wash days, I always finger detangle my hair with some oil or conditioning product. When styling your hair, try not to pull too much at your edges. The edge and nape of your head are more prone to breakage. Keeping hair in a pony tail all the time can cause breakage at the point where the hair is gathered together. When you understand the difference between hair breakage and shedding, it will help you address the problem and keep your mind at rest in determining what steps to talk to minimize breakage. How are you handling breakage? 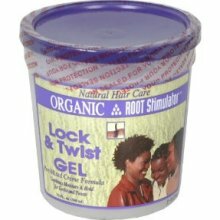 ﻿What is Organic Root Stimulator Lock & Twist Gel? This product is a light gel used for twisting and locking hair. It can be applied to wet or dry hair. I used this product for my daughter (type 4bc hair). It provided great hold and I like the fact that it did not have the whitish residue that other products have when combined with other hair products. I used this just with oil and her hair was lightly spritz with water. The only thing is that I had to seal her ends with my shea butter mix. The gel did not hold on to the end. It worked well for her edges. Her hair was also very moisturized and had a nice shine to it. 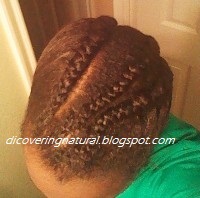 The gel does help lock the twists to each other, as seen in the picture below. When doing simple twists on my 3c 4a haired daughter, I started with apply oil on a section of her damp hair, then I applied Shea Moisture Curl Enhanced Smoothie, and after that I twisted with the ORS lock and twist gel. Her hair did not like that. It felt hard and unmoisturized. I decided to do the oil, and just the ORS lock and twist gel. Her hair liked that better. 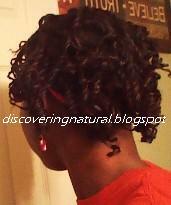 The only thing was that the twists didn't lock as well as it did on her sister's 4c hair. I used this product on my hair, I first tried using it to do my cornrows, but my hair kept on getting tangled. That was a BIG mistake. I must mention that my hair was dry, not damp or wet. I then decided to apply the hair to my two strand twists. I LOVE LOVE LOVE it!. I did not have to seal my ends with my shea butter. When I used Shea Moisture Curl Enhanced Smoothie in the past, I had to seal my ends with shea butter to keep it from unraveling. I was glad about this. 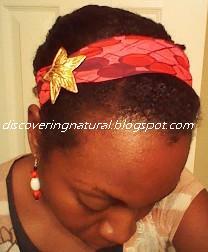 After doing my style, I put on a scarf to help with my edges, it the gel did really good keeping the frizz a-bay. I will use this product again and again on my hair and my 4c daughter's hair. It did leave my hair feeling very moisturized and I loved the shine I got. I just recently discovered how creative I can be with scarves. In the past, the only use for my silk scarves have been as a head cover for bed. I have not thought of using them as hair accessories. Now that I know, there is no limits as to how many ways that scarves can be worn. So, let's have some fun with scarves today. Here are a few video tutorials not made by me ;) that I love. Here are some simple ways I wear my scarf. I know you've all been there. You do a style and it does not look like what it was suppose to. Well, that happened today. I had twisted my hair and hoped the curls will come popping out! But oh, no! My hair had something totally different it wanted to do. It decided to puff out! not... small friendly puff... The kind of puff that makes you want to just put a hat on it and call it a day. Instead of giving in to the urge of wearing my Fedora hat, I decided to do something low maintenance. So here it is... short and simple. Use a generous amount of Eco Styler gel on the front part to tame the frizz. With a soft brush, smoothen hair into a low bun. Of course, don't forget the hair accessories. What do you do to your hair when you have a bad hair day? 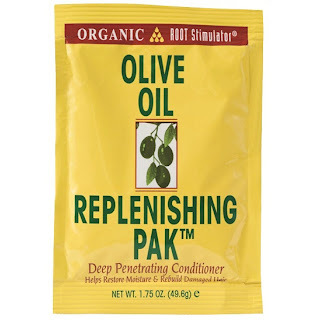 ﻿What is Organic Root Stimulator Olive Oil Replenishing Pak? 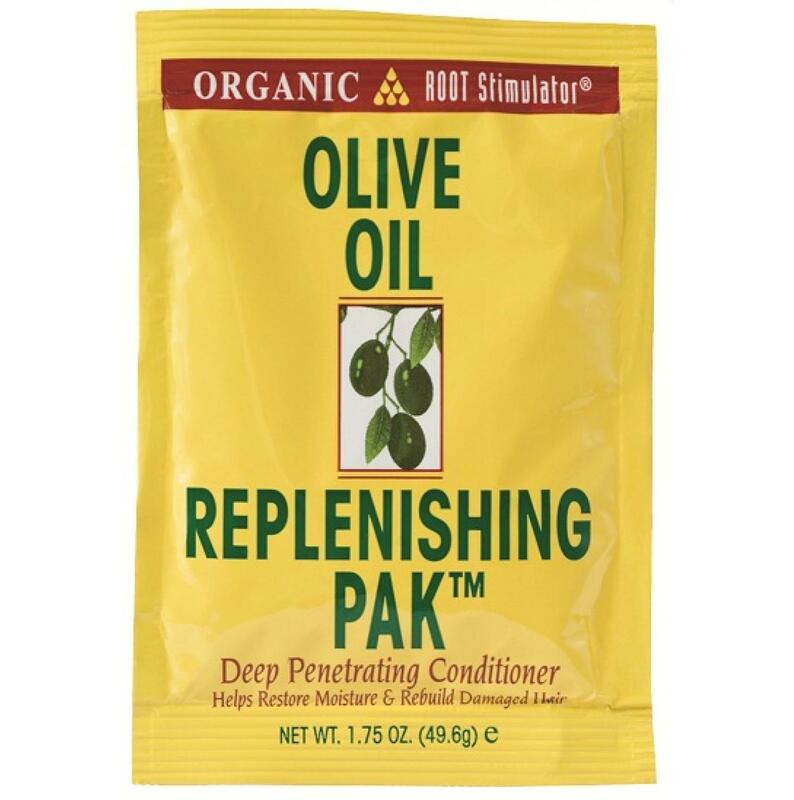 ORS Olive Oil Replenishing Pak is a deep conditioner that helps moisturize and rebuild damaged hair. It leaves the hair feeling soft and very manageable. It comes in a small package, so if you don't like it, you will not have leftovers. It is also sold in bottles. First of all, I love the way this product smells. After washing my hair with shampoo, I applied the ORS Olive Oil Replenishing Pak generously on my hair and used my fingers to properly distribute the product to each strand of hair. I covered my hair with plastic cap and left it covered for one hour. My hair felt incredibly soft after washing this product off. I was able to comb my new growth easily.. if only I can type how soft this made my hair... I will surely be using this product from now on. I highly recommend it!! I've been wearing my hair unprotected for a couple of days now... so it's time to protect "her" for the week. I wanted to do something that did not take too much time to style. I believe it took me about 20 minutes to complete this style. Part hair in front from ear to ear. Divide the part in the middle to create a cornrow braid going from center to ear on each side. 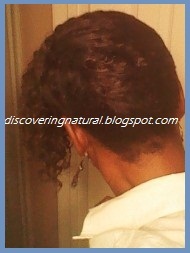 For the remaining hair, divide hair into 4 parts going from crown to nape (back of hair). 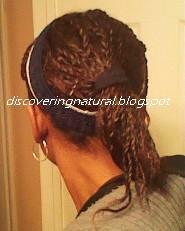 Inter-twist each of these three two strand twists from front to the back. It should look as if you actually cornrowed your hair from front to back. When all these are done. Put hair in a bun towards the middle of the back of your hair. Attach your favorite hair accessories. 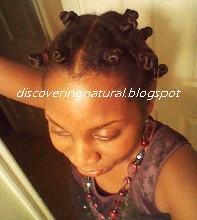 Bantu knots can be worn in or out. 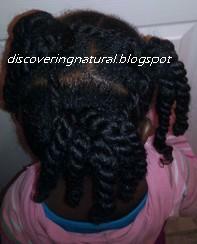 I have done bantu knots on my daughters hair in the past, but I have never tried this on my own hair. Shampoo hair in two sections (front-back), and detangle. 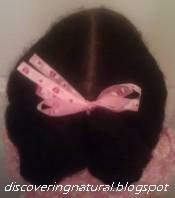 I used Creme of Nature Detangling, Conditioning Shampoo. Deep Condition hair. 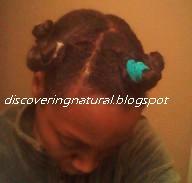 I used Organic Root Stimulator Olive Oil Replensing Pak. I loved how it made my hair feel. Worth keeping on the DC list!. Wash hair to remove DC product. Section hair into three parts. First, divide from middle front to middle of hair, and then from ear to ear. It should look like you are writting a T. The two front sections will be the same, where as the back section will be bigger. I decided to give my hair a good combing session and a half inch trim. I used a paddle brush for my relaxed ends and a wide tooth comb for my natural hair growth. Before doing the combing, I examined my hair for any breakage. I highly recommend doing this. I found only a small patch of breakage on my crown section. Nothing to be too alarmed about. I was actually okay with it and this patch of hair was au naturale. It was very soft and had a curly pattern to it. Yeah! I hope the rest of my hair feels and looks like this when I am done transistioning. SO EXCITING!!!! 5. For each section, Take some hair strands and twirl the hair towards your face. For the first twirl, you can secure with bobby pin. You then start to twirl the remaining hair to the base of the starting twirl. I used Kimmaytube's YouTube video to perfect my Bantu Knots. View video below. I secured my hair with my silk scarf, since it was time for bed. In the morning, I applied some coconut oil and castor oil to my fingers and gently untwisted the Bantu knots. I seperated the knots to create the style I wanted. If you seperate each knots more than once, you can get the appearance of fullness. A lot of things are trial and error when it comes to getting a wash routine. I have learnt this and now found a way of washing my hair that helps reduce breakage and keeps my hair moisturized and detangled. Here is my wash routine. I wash my hair every 7-10 days. If my hair is in a protective style like twists or cornrowed, I apply some coconut oil to my fingers and then un-twist or unravel the cornrow braids. I make a mixture of EVOO and some conditioner and apply to each section while finger-detangling my hair in that process. Put a plastic cap on my head for as little as 15 mins or overnight. I usually do the overnight, unless pressed for time. 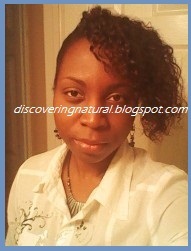 Shampoo my hair in sections using Creme of Nature Detangling and Conditioning Shampoo. Once a month, I clarify my hair using a shampoo that contains sulfate but also has lots of moisturizing ingredients. I ALWAYS DC my hair when I wash. I make a mixture of ORS Hair mayonnaise (I used this every other week), Silk Elements Luxury Condition, BB Growth Oil, Coconut oil, Jojoba oil. On weeks I don't use the ORS Hair Mayonnaise, I use the Shea Moisture Deep Treatment Masque or ORS replenishing pak. Put a plastic cap on my head. If I don't want any heat, I usually cover my plastic capped head with a warm towel for at least 1 hour, else, I sit under the hooded dryer for about 30 mins. After the DC process is done, I use the LOC method, applying a mixture of oils, such as coconut oil, Vitamin E, jojoba, almond, and grapeseed oil. Then I apply Shea butter mixture all over my hair. Once a month, I also give my hair a very good combing since I finger detangle most of the time. Two Strands Twists are one of my favorite styles because of how many different ways it can be designed. The picture shows these ways. 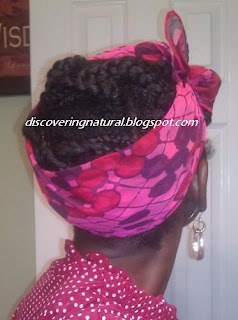 You first start off with your hair all twisted up, you can wear this for a couple of days, or as long as you want to. When it start looking a little messy, you can use flexi rods or even perm rods to create a Curly Two Strands Twist style. Next, you can also change that style to a twist out. 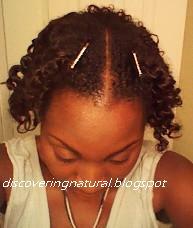 Create this Tight twist out by only seperate the two strands of hair that make up the twist. For a loose or fully look, seperate the already seperated strands of hair again until you have reached the fullness you want. 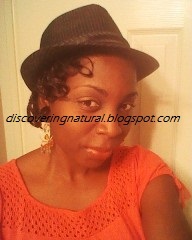 Check out this website for ways of maintaining your twists and getting the perfect good hair day. Don't forget to add some hair accessories. I wanted to freshen up my one-week old two strand twists. So, instead of retwisting, I decided to try something new. 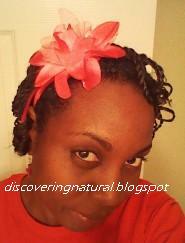 I have not tried using Flexi Rods before and decided to do a curly two strand twists using them. 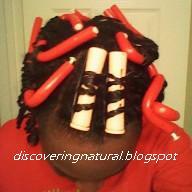 Flexi Rods are also known as Super rollers. You can get these at any beauty shops, and they come in various sizes. The ones I used was Red 7/16 inches flexi rods. Spray hair with water, avoid totally saturating it. Apply your oil to your hair and seal with your cream. Taking a couple of two strand twists at a time, spray some setting lotion (I used LottaBody) on the hair, especially the ends if you are transistioning. 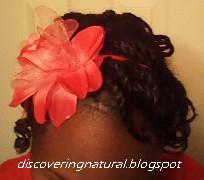 Using the Flexi Rods, roll hair in a way so that they do not overlap each other on the rod. 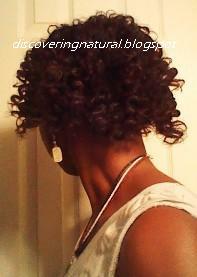 I added some perm rods on my bangs section to give smaller curls. I choose to air dry my hair by wearing it like that for a couple of hours. As I learn how to work with my new natural hair growth and do different transistional/natural styles, I found a style called Shingling. You might be wondering, What is Shingling? Shingling is the process of defining your curls by applying products to one section of hair at a time. You can do this with either gel or a curl enhancing product, or a combination of both. It does take trial and error as you will see below. I decided to try this on my daughter's hair. She has more of a type 4a/4b type of hair. I will try this on her sister' hair in the future. Her older sister has a type 4c hair. I still don't know what my hair type is, but I do see evidence of both types. Shingling is mostly done on all the hair, not on just the ponytail. The reason I did it on just the ponytail was because we were in a hurry to leave the house and I just wanted to try something fast and new. Step 3: Apply a little bit of oil mix all over her hair. Step 4: Secure her hair into a ponytail at the base of her head. 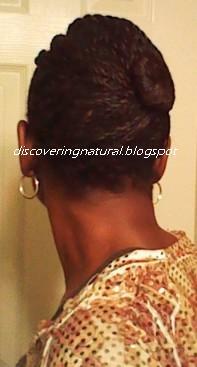 I did loose ponytail because I did not want to pull too much on her temple and nape (edges). Step 4: Working in sections, apply Shea Moisture Curl Enhanced Smoothie to ponytail. Using your fingers in a raking motion, comb through the hair, stretching it slowly. Some people use wide tooth comb or brush for this process, but I prefer using my fingers. Step 5: Repeat Step 4, but this time with Eco Styler gel. ﻿I liked how the curls came out, very defined. The only thing that I didn't like was that some of the product still showed. I did manage to rub it in before letting her leave the house for school, but it took some time. I was discussing this with a friend, and she said that the reason why the Shea Moisture Curl Enhanced smoothie did not quickly get absorbed was probably because of the oil I put in her hair prior. So, I will be redoing this Shingling method in the future to all her hair, and I will update you on my findings. View this video to see other ways of shingling hair. Have you trying Shingling your hair? If so, any tips or tricks? I would say I have days that I love my hair and days that I am not so in love with my hair. On such days, I usually have my hair covered with a hat or beanie. But shouldn't we all love our hair. We love ourselves, right? So, what does your hair need to be loved (to look healthy)? Moisture is very important for the health of your hair. If your hair is not moisturized, it will break. There is no way around it. Keeping your hair clean and moisturized will promote healthy hair and growth. One way to moisturize your hair is using the LOC method. Liquid, Oil, and Cream. Simple. There are several vitamins in the market geared towards hair care. Protein is the number one vitamin that the hair needs. If you look at the ingredients on your hair product bottles, some may already contain protein. Protein helps strengthen your hair if it is brittle, and it also coats and fills the hair shaft. Also, you can take vitamins such as Biotin which is beneficial to skin, nails and hair. Your hair needs to be protected against elements that can damage it. Using different protective styles to keep your ends from splitting and your hair from breaking can help promote growth. Whereas, using a lot of heat and using pony tails all the time can cause your hair to break. Your night routine also comes into play. 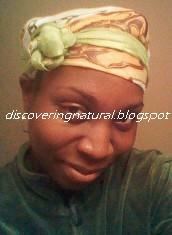 Protect your hair by covering it with a satin bonnet or a silk scarf when going to bed. If you don't like wearing anything on your head while sleeping, you can try using satin or silk pillowcase. I just wanted to share this with you all. I decided to wash my daughter's hair today and since I had not pre-poo her hair in a while, I wanted to give it a try. I normally pre-poo my hair and her older sister's hair. She has very thick curly hair so I kept my fingers crossed that her hair will retain the moisturizing benefit that pre-pooing provides[/URL]. Here is what I mixed for the pre-poo treatement. 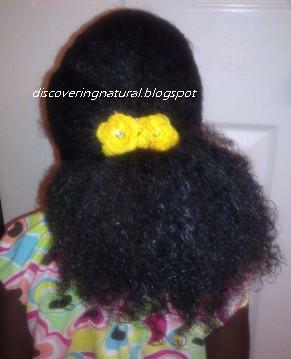 After letting the mixture sit on her hair for 30 mins (under a plastic cap), her hair was very moisturized. It also gave her curls more definition and shine. Her hair also had a nice bounce to it and felt SO soft. I was amazed. We will definitely be pre-poo this girl's hair.. ALL the time now. I will try doing this process when doing a "wash and go" still for her. - Style with Coconut oil, BB Growth oil, Jojoba Oil, and Jamacian Black Castor Oil. - Divide hair into two parts. 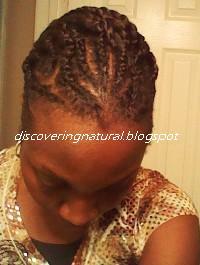 - Do single flat twists on each side, working your way to the base of each part. - Attach a black ouchless hair tie to each side. the Heart. Keep the two twisted ponies together with bobby pins. - Attach pretty bow or ribbons. Can't have enough of those good oils! Oils...oils...oils...I love me some good oils! But when is it too much? 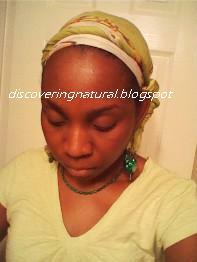 I was watching a product review of BB's new natural hair line "Tropical Roots" on YouTube by AfricanExport. By the way, she has such nice natural hair. Love it!. According to the "Alternative Field Crops Manual," canola oil is high in both oil and protein-- two ingredients that play a role in restoring hair's health. 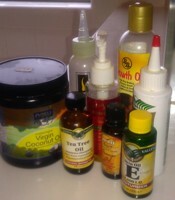 So, let's see how many oils I now use for my hair,....and I do have a good reason for each and every one of these oils. LOL!! Here is my list from most important and used to least. Should I add canola oil to this evergrowing list? I am on the bench about this. Actually, I don't think I will be doing this. I just ordered Jamaican Black Castor Oil and excited about trying it for my edges. This will probably be replacing Dr Miracle Temple and Nape balm that I currently use. I will keep you all updated regarding this product once I start testing it. So, what is the one oil that you can't live without? How has oils help improve the health of your hair? I have had my two strand twist protective style now for a week and will have it in for another week. 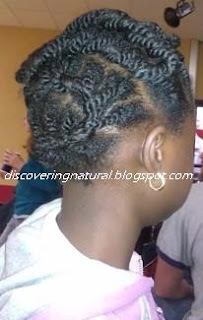 If not properly taken care of twists styles can become quite messy. I am learning as I go, but wanted to share what I tried this morning. Look at each twists to check if any has untwisted. 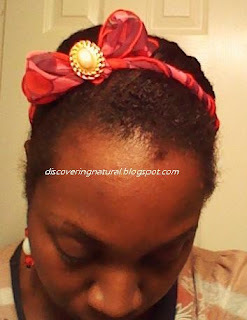 Since my hair is still transistioning, it is easy for the relaxed part of my hair to untwist. If I find any twists that have come undone, I spray some water onto the palm of my hands and rub into the untwisted hair. I apply some coconut oil to the hair and then apply Shea Moisture Curl Enhancing Smoothie OR Eco Styler Gel to the strands and retwists. I experiemented with both products and found the SMCES to be more moisturized than the Eco Styler. To the remaining hair, I again spray my hands with water and rub over my hair. Apply coconut oil to my palm and run it through my hair. I took a little Shea Butter mix and apply on my hair. For my front edges, spray edges with water, apply some oil, and some Eco Styler. 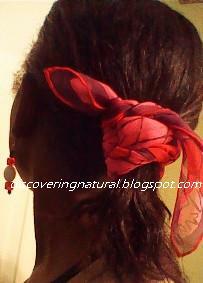 I used my fingers to gently smoothen the Eco Styler on my edges and tie down my hair with a silk scarf. Using the scarf, gives my edges a wavy effect. I have always done a pre-poo treatments to my hair since I learnt of the benefits that it provides. Pre-pooing is the process of applying oils and/or conditioners to your hair prior to shampooing it. The shampoo process can strip your hair of much needed oils and by pre-pooing you are doing sort of a hot oil treatment to your hair to lock in moisture prior to washing your hair. By maintaining moisture, it helps prevent your hair from breaking. 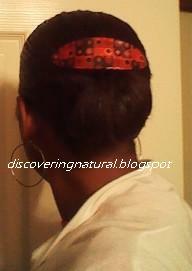 It also helps in detangling the hair when it is applied while finger-comb your hair. Using a small bowl, I add about 2 tablespoons of Extra virgin Olive Oil to about 3 tablespoons of conditioner and mix well. In the past, I have used Suave Professional Sleek Conditioner for dry and frizzy hair. I have also used Lustrasilk Cholesterol Olive Oil. Leave on hair for as little as 15 mins or overnight. I usually leave the mixture on my hair overnight, making sure to cover my hair with my scarf. Have you tried pre-pooing your hair? What do you use for the treatment? If you have some bananas that have gotten too ripe to eat, instead of tossing them into the trash, make some yummy banana bread! 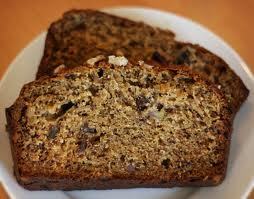 I promise, this is the EASIEST from scratch baking recipe ever. Bake for 45 minutes. (check after 30 minutes and 10 minutes afterwards). The LOC method is the three steps of moisturizing your hair and sealing in the mositure into your hair to keep it from drying and breaking. This method can be done as often as needed. I like to do this especially to my edges and my ends which tend to be drier than other parts of my hair. But at least once a week, I do this to my entire hair. Liquid can be derived from when you wash or co-wash your hair or simply spraying your hair lightly with water. What I do on a regular basis is wet my hands with water and just run my wet hands through my hair. I read somewhere that when you wash your hair with water, do so using lukewarm water because hot water actually dries up your hair. Oils are SO good for your hair. They are one of the most natural products to use to moisturize your hair. Apply your oils to your hair making sure that it thoroughly penetrates your hair shaft. I like using a mixture of essential oils such as coconut oil and jojoba oil. I like coconut oil because it is very moisturizing and penetrates my hair shaft, reduces frizziness and promotes shine. I use jojoba oil because it moisturizes my scalp and doesn't evaporate like other oils. It is also a good moisture sealent. It is also known to strengthen your hair shaft, keeping it from being brittle. 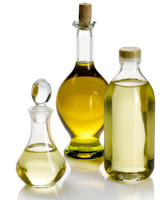 Try different types of oils to see which one works well with your hair. 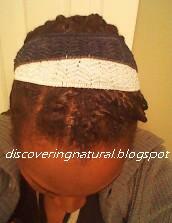 Applying your hair cream is the last step of the LOC method. 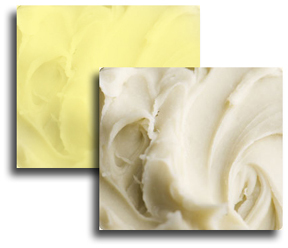 Use a rich cream product to seal in the moisture into your hair. Make sure that you apply a generous amount to the ends of your hair since that is the part of your hair that gets really dry. The cream that I use is my Shea butter mix. Another product that I use in the Shea Moisture line of products. Some people use grease, but I personally don't like using it when doing the LOC method because it leaves my hair feeling weighed down. It is important to check ingredients of products you use to moisturize your hair. If those products have ingredients that dry hair, such as alcohol, please consider not using them. If you are wondering...."What is Bagging? ", then let me give you Bagging 101. 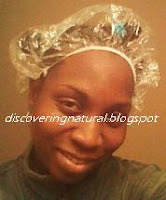 Bagging hair is the process of moisturizing hair without the process of washing it. It requires you to apply essential oils to your hair and covering your head with a plastic cap. It's quite as simple as that. This process can be done any time of the day, but most people do it overnight. It sort of gives dry hair that needed moisture boost. I decided to bag my hair differently this time to see if I get it even more moisturized. Instead of applying oils, I made a solution of water, a little Silk Element Luxury Conditioner, and a few drops of jojoba oil. I sectioned my hair into six parts. One part was for my bangs because I just love wearing my bangs.. LOL! Working through each section, I sprayed the section of hair with the water + conditioner mixture, tied it down with a scunci cloth hair tie, twisted that section and created a bantu knot. 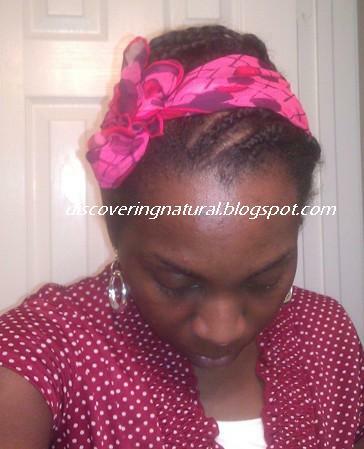 This is so as to stretch my hair for the two strand twists style I will be doing later. I covered my hair with a plastic cap and tied a scarf over it.. Night-Night! My hair was a bit damp in the morning. I think I might have over -drenched it with my water + conditioner mixture. It did however feel so soft. I was thrilled that even my new growth was so moisturized and not super oily like in the past when I bagged with oils. I love that! I decided to undo the bantu knots off each sections so as to get the hair to dry faster. Apply a little Cantu Shea Butter Leave-in creme to each section. By the way, Cantu Shea butter on my wet hair leaves it feeling weird! but on my dry hair... feels great! Using only fingers, take a small section of hair (enough for pencil-width twists), apply Shea Moisture Curl Enhancing Smoothie to the new growth. Massage it into the hair and also to the relaxed hair. 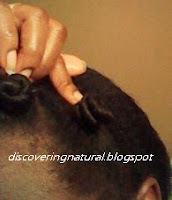 Two-strands twist hair and apply my mixture of shea butter to the ends to keep it from unraveling. Have you tried bagging your hair? Share your experience. The key thing to remember is that when you have dry hair, it is hard to retain hair growth because to do so, hair has to be moisturized to reduce breakage and promote growth. Have you had one of those mornings that you are in such a hurry and have no clue what to do with your hair? Well, I had such a morning today. Everyone was ready ... and of course ... waiting on me. 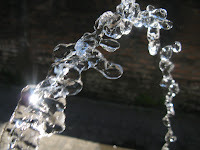 I had done my hair in three braids three days earlier, and didn't want to go out in that style. So, quick thinking took over.... I decided to do a braid out instead of putting my hair in the familiar puff or ponytail. Put a bit of oil (I used coconut oil) on finger tips. Apply some Hawaiian Silky Miracle Worker on hair to add condition and shine. Fold hair in the back into each other and use bobby pins to secure hair, working your way towards the crown of your head. Hats are always a wonderful accessory especially for those "bad-hair" days. However, that should not be the case. You too can rock hats, caps, even stylish scarves on "good-hair" days. 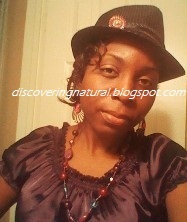 I love my wool fiddler hats, but now, I am really loving Fedora hats. Fedora hats have been in existence as early as 1891. Classified as men's felt hats, they have been adapted into the ladies fashion wears. What I like most of all is being able to customize them with different other accessories such as brooches, ribbons, and even feathers. Do you own a Fedora? How do you wear it? Aqua, Sodium Lauryl Sulfate, Cocamidopropyl Betaine, PPG-5-Ceteth-10 Phosphate, Disodium Cocoamphodipropionate, PEG-30 Glyceryl Cocoate, Hydrolyzed Keratin, Hydrolyzed Silk Serica......blah....blah......blah..
What are these ingredients?... and even I guess the question we all should be asking ourselves is what are these ingredients doing to and for our hair. And why should we care? Well, if you care about the health of your hair, then you should care. I believe that the health of your hair is equally as important as the health to your body. Some of us, me included, read nutritional facts on foods that we buy. We stay away from high calories food and sugar overloaded drinks. Why not pay the same attention to ingredients that is in our hair products? I have never read the ingredient panel on the bottles and jars of hair products I buy.... that is to say... not until recently. When I was researching the process of going natural, I learnt that some shampoos actually hurts the hair more than they help it. I learnt that shampoos containing sodium lauryl sulfate can cause the hair to become dry and should be avoided. Personally, I use shampoos that do not contain lauryl sulfate, however, once a month, I do clarify my hair to remove product build up. 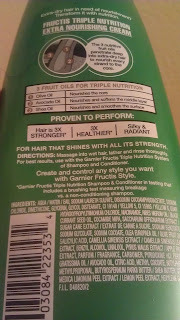 For my clarification, I do use a shampoo that contains lauryl sulfate.I used Garnier Fructis Triple Nutrition Fortifying Shampoo which contains a lot of moisturizing ingredients such as Coco Betaine also known as Cocamidopropyl betaine. Coconut oil is one of the make-up of this ingredient, which is a moisturizing agent. 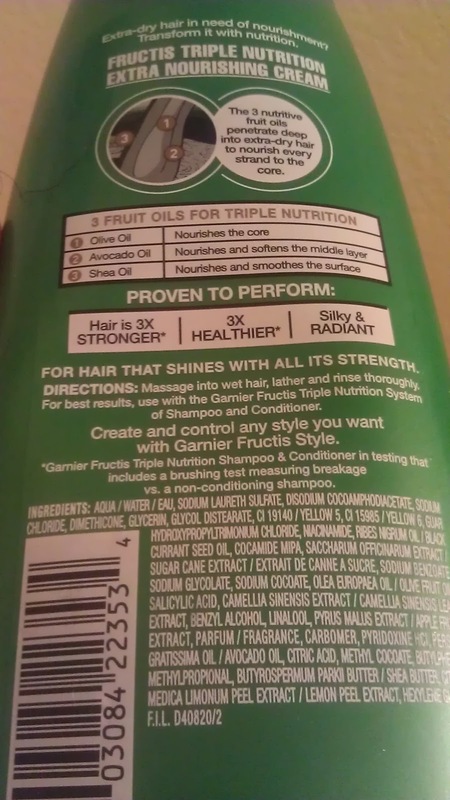 Also, don't forget to look at the ingredients panel of your conditioners. TightlyCurly.com has a list of ingredients that have been marked with labels Good, Okay, Caution, Avoid. Do you read hair product ingredients? What products do you try to avoid?